I also incorporated shortwave sounds in my own music. Here are video links to my YouTube page which might interest you. Thanks for sharing your work, Bruce! Very cool! I need to get you in touch with David Goren for inclusion in a future Shortwave Shindig! This entry was posted in Art, Music, Shortwave Radio and tagged Bruce Atchison, Holger Czukay, Shortwave Art, Shortwave Music, Shortwave Radio on October 22, 2018 by Thomas. This is a lot of radio for such a small size. The CC Skywave is a great travel companion because of its portability and price. Moreover, it’s rich with features. The receiver tunes in AM and FM as well as all the shortwave bands, NOAA weather channels, and the aircraft band. The latter comes in handy while you’re waiting for flights so you can find out immediately and directly what is delaying them. It also has a built-in alarm clock so you needn’t miss the next morning’s activities. The Skywave runs on 2 AA cells and can be set to charge NiMH rechargeable batteries. Its mini-USB port lets you use the AC adaptor or 12 volt cigarette lighter adapter. You can even use one of those cell phone solar panels to power the set. This radio’s reception is excellent and its filters allow for eliminating adjacent channel interference. Apart from its rather high noise floor on AM, the receiver pulls in stations at night very well. The Skywave can also add local stations to its memory pages automatically. This comes in handy in foreign cities when you don’t have time to manually scan the AM and FM dial. This is truly a globe trotter’s accessory. You can set it to European AM channel spacing and the Japanese FM band. The radio even has a fine tuning setting for oddly-spaced stations. The three amber LEDs light up the dial nicely and they turn off automatically after about ten seconds to conserve battery life. In fact, the Skywave is amazingly energy efficient. Whenever I travel, this radio is one thing I’ll be sure to pack. It’s all I need when I travel away from home. Thanks for sharing your thoughts, Bruce. 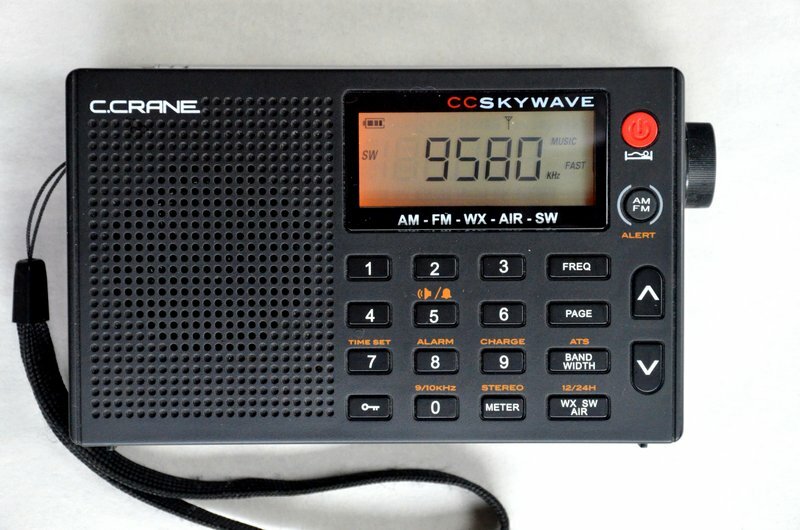 Yes, I believe the Skywave is a great little travel radio, too. One of the Skywave features I used extensively while off-grid in Canada this summer, was the weather radio function (Environment Canada and NOAA frequencies are the same). Without Internet, it was an excellent, handy source of weather information. This entry was posted in News, Radios, Reviews, Shortwave Radio, Shortwave Radio Reviews and tagged Bruce Atchison, C.Crane CC Skywave, CC Skywave on August 12, 2016 by Thomas.